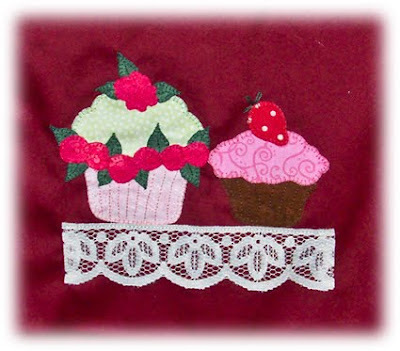 A Sweet Surprise & Stitching Progress! 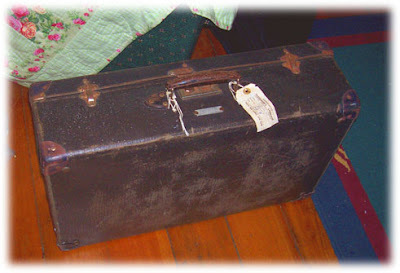 My Bags Are Packed ...!! OPAM Sign Up Now Closed!! I'm really enjoying the "busman's holiday" of following someone else's pattern for a change and although the colours I'm using are a little brighter than Leanne's, I'm keeping them fairly similar as I love the overall look of her quilt. Not to mention I'm having fun playing with my stash of Aviary fabrics, too! :0) I'll need to get back to working on deadline-driven projects again now, but it's been so refreshing to take some time to sew just for "ME"!! Here I sit, listening to the thunder starting to rumble and hoping I can finish this post and turn the computer off before the threatening storm hits - if it hits! The last few days have been SOOOOOOO hot and humid that even this summer chick is a little over it! :0) Thank goodness our house is an old-style one that was build just for Aussie summers - 12 foot high ceilings, great air-flow, a little off the ground, polished floors and fans to keep the air moving. Still, finding a cool spot to curl up with an icy drink and a book seems to be my favourite pastime this week! Tee! Hee! Hee! And those storms just keep going around us ... no rain ... no relief from the humidity ... SIGH! Do you know how HARD it was to find MAROON tea towels?!?!?! There was red, blue, pink, green, white, brown, beige ... but I checked out just about EVERY manchester and kitchen section in Toowoomba shops before managing to find these as a pack of three. 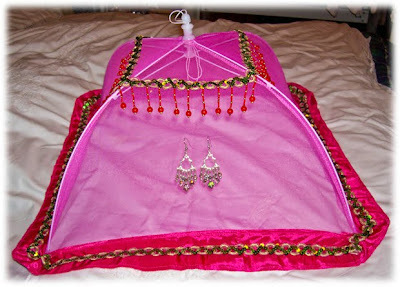 (The third had a pattern that didn't lend itself to appliqué.) Hmmm ... that sounds like I spend a lot of time shopping, but I don't ... really ... and you should tell my beloved GB that if he asks! Tee! Hee! Hee! 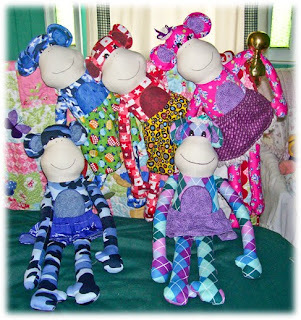 Anyways ... that's Lynette's birthday present finished - now I just have to find/make her something for CHRISTMAS! Tee! Hee! Hee! Actually, I thought I might keep an eye out for a cupcake shaped hook/hanger for her to put on her kitchen wall to house her new apron and tea towels. Hmmm ... this could be quite a quest. In the words of one of my favourite TV ads ... "Still looking!" :0) Perhaps the Queen of Cupcakes will be able to help me! Tee! Hee! Hee! We packed up bright and early Saturday morning (well, early for us night owls! Tee! Hee! Hee!) and headed off down the hill to Linda and Tim's new island home. And although we DID forget we were supposed to say "I can see the bridge!" 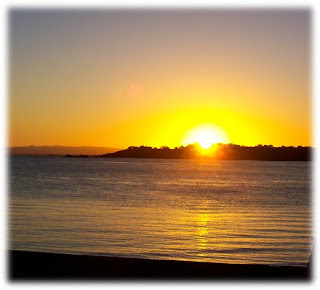 (the chant Linda and the kids repeat each time they come back to their island from the mainland!) when we spotted it, I DID say "I can see the water! 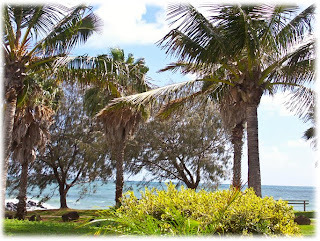 ", as that was the little chant that MY family had when we holidayed at the beach. Look at that GORGEOUS bedroom!! 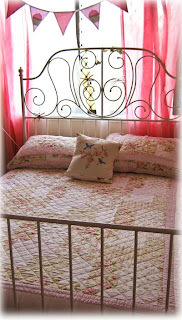 It was just like sleeping in a little corner of Lilly Cottage! :0) But time was a-wastin' and we had things to do, adventures to have, tea to be sipped and stitching to do! 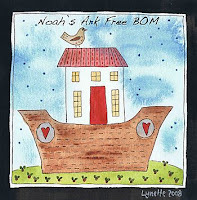 :0) Now, Linda and I very cleverly sent our boys and the kids off on a 4WDing adventure for the afternoon while we curled up in the lounge room with stitching and some quiet music in the background ... which we proceeded to mostly drown out with our chatting! Tee! Hee! Hee! And I supposed that after telling you all the prep work I did on Friday so I could stitch and stitch with Linda, I have to confess that I didn't do QUITE as much stitching as planned ... but it's all Linda's fault! Tee! Hee! Hee! You see, she has a FABULOUS collection of GORGEOUS craft and decorating books in her lounge room that I just HAD to delve into. 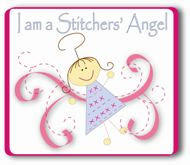 So ... really, what happened was ... Linda stitched and I looked at pretty, pretty pictures! Tee! Hee! Hee! After the 4WD adventurers returned home with tales of super bumps and a spot of traction-impairment (the got BOGGED!! Tee! Hee! Hee!) we all piled into the Lilly-mobile and headed (via the fish and chip shop!) 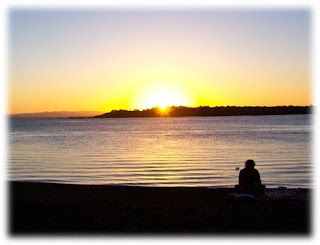 to the water's edge to enjoy a sunset picnic. 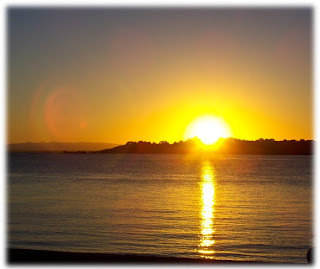 Isn't that golden glow fabulous! ... lower still and almost slipping behind the mainland. And after the sun finally slipped completely below the horizon, I snapped this shot of the bridge to the mainland. 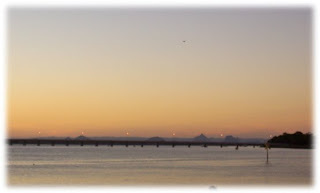 I love the soft mauves and apricots of the sky with the Glasshouse Mountains in the background and the bridge in the foreground. I don't know if you can see it (click to make the photo a bit bigger and you might) but the bridge lights had just flickered on and looked like faerie lights reflecting in the calm, calm water. SIGH!! It would have been wonderful to sit there soaking up the serenity for hours (How's the serenity?! Tee! Hee! Hee! Aussie movie quote for overseas buddies who have no idea what that means!) 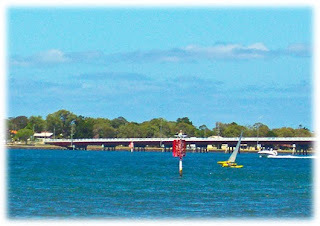 but the sandflies were starting to get a little TOO friendly, so we adjourned back to Linda and Tim's lounge room where we feasted on raspberry ripple cake with creamy icing, washed down with freshly brewed tea while we chatted ... and chatted ... and chatted ... and chatted ... and ...! :0) OK, so, I think you're getting the idea that the four of us DEFINITELY didn't have to endure any uncomfortable silences or lags in the conversation! Tee! Hee! Hee! After sleeping soundly and contentedly in our beautifully appointed guest room (thanks for the loan, Courtney!) we woke the next morning to the tantalising scent of sizzling bacon . MMMMMMM!! Did I mention that we were SERIOUSLY SPOILT at meal times throughout the weekend!! 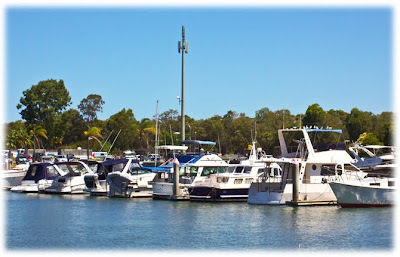 :0) Fortified with our delicious bacon and scrambled egg breakfast, we sent the boys and kids off fishing and swimming while Linda and I headed to the local markets where we had FUN!!! We weren't TOO naughty, but thoroughly enjoyed checking out the work of local craftspeople, as well as a browse through the cultural centre where we saw some truly amazing artwork ... and enjoyed a spot of staning under ceiling fans on a scorcher of a summer's day! We then trundled off to meet up with the keen fisherfolk to see what they'd caught (two little whiting that had to be thrown back, but they WERE fish and they WERE caught, so mission accomplished! Tee! Hee! Hee!) And while the kids had a dip and the big boys had naps, I did some of my stitching while Linda enjoyed flipping through a magazine. And if we didn't get as much done as planned, perhaps we can blame it on the view being too distracting ... what do you think? The boys were trying to decide which one of these they'd buy themselves if they won lotto! 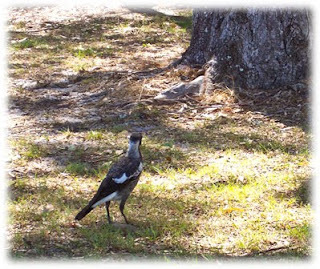 :0) And while we were enjoying our view, we had a little visitor ... a NOISY visitor!! And although I didn't get very much of my stitching done, it's a public holiday here tomorrow for AUSTRALIA DAY to celebrate our unique and wonderful country, so I am sure I'll find some stitching time and I promise to come back with some photos of what I'm working on ... the first NON-Secret Squirrel projects I've been working on this year! 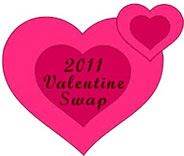 :0) Hope all you OPAM gals are remembering to add your finishes to your sidebar list, cos it's only a few days til Peg and I begin our round up and draw the first end of month prize for 2010. In the meantime, enjoy your stitching and a very happy Australia Day to all my Aussie buddies! Didn't they come up well!! One has lovely roses swirling around it, while the other looks like a chocolate cupcake with strawberry icing and a strawberry on top. I have to confess, I cheated here a bit too. These two gorgeous designs are from a very handy little book by a clever-clogs designer and my good blogging buddy Kerryanne English of Shabby Art Boutique. The booklet is "Shabby Doodles" and there are SOOOOO many fabulous sketches and designs in it that can be used for card making, decorative painting, applique and stitchery projects - limited only by your imagination! Check out Kerryanne's website for details about this ... oh ... but be careful! She has so many FABULOUS things on her website, including faux cupcakes and art for sale, that you're likely to get very sidetracked! 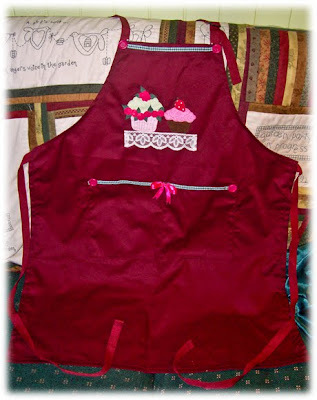 :0) I think Lyentte will like her apron. 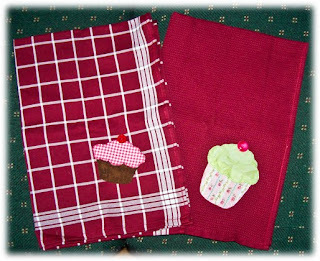 I'm thinking of looking for a couple of tea towels to match and perhaps a pot mitt ... shall see what I can find to match. Just a really quick post to let you all know that Peg and I have reached the 200 sign ups on the OPAM spreadsheet, so sign up is now officially CLOSED! If you've missed out, you're welcome to play along at home and keep your own list of finishes ... you just won't be eligible for prize draws, but as someone pointed out during last year's OPAM - everyone is a winner cos they end up with so many finished projects that might otherwise have stayed sitting in their cupboards! 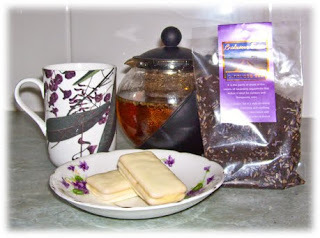 A pretty tea cup I got from my dancing buddy Deb for last birthday, my trusty little single serve teapot, lavender tea steeping away, a new packet of lavender tea and ... WHITE Tim Tams! YUMMO!! I discovered these last trip to the grocery store and I LOVE 'EM!! :0) I'm not a real chocolate fan, but LOOOOOOOOVE white chocolate, so these bikkies are just for me!! As to my lavender tea ... it's good quality black tea leaves with dried lavender flowers through it to give it a subtle scent and flavour full of all the WONDERFUL properties of my favourite herb! 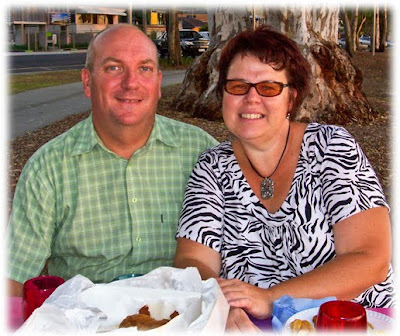 I stocked up with about four packets while we were away on holidays, because a trip to the Bundaberg area would NOT have been complete without dropping in to visit Helen at Amandine Lavender Farm and Gift Shop!! A practical, portable advertisement! Tee! Hee! Hee! How COOL is this!! 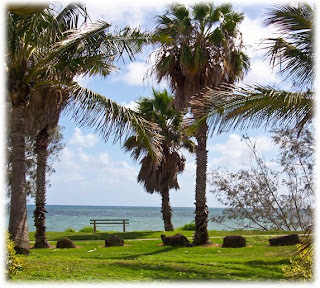 Helen says her little purple car has become a well-known and recognised sight around Bargara and is almost a tourist attraction in it's own right! :0) But no matter HOW much I begged, GB would NOT let me paint bear paw prints all over our little car ... what a spoil sport! Tee! Hee! Hee! 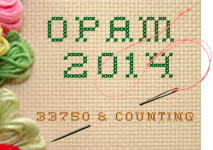 It seems I've been making a few "OOPS'" when I've been posting Peg's email address for you gals to contact for OPAM. In a few places, I've mistyped Peg's email and another lovely lady has been getting them - SORRY!!! I've apparently typed a "H" in there in a couple of places. So ... if you've been trying email peg and not getting an answer ... that's my fault and if you've saved our email addresses into your address book you might want to update that. WOWSERS!! There are a LOT of WISPs and "To Do" lists out in blogland, I think, cos so many ladies have been HUGELY excited to be joining Peg and I for OPAM 2010! In fact ... there have been SOOOOOO many excited ladies ... and Peg and I are big softies ... so we've decided to extend OPAM 2010 to 200 places. Which is good news for some of you, since our list is already around the 160 mark! :0) So ... 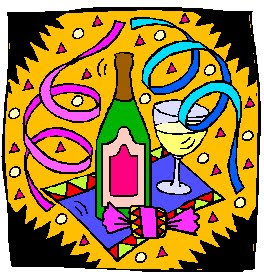 If you hadn't emailed Peg or Me to join in the fun of OPAM 2010 cos you thought you were too late ... you've been given a reprieve, so email your details to us. Remember we need your NAME, your BLOG ADDRESS and your EMAIL ADDRESS. A few of you have been signing up via comments on my or Peg's blogs and you're marked as "no-reply", so we can't find your email address unless you give it to us. SIGN UP IS NOW CLOSED! 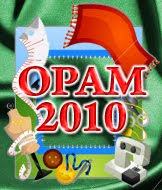 THANKS TO ALL WHO'VE JOINED OPAM 2010 - HAVE FUN!! LET THE OPAM CHALLENGE FOR 2010 BEGIN!! The idea of the “One Project A Month Challenge is pretty simple ... To try to finish at least ONE craft project by the end of each month. This can be something you’ve had partly done for a while (a Work In Slow Progress or WISP), a pattern you bought ages ago that you finally get around to making up, or a completely new project - it’s entirely up to you. This is meant to be a low-stress challenge - if you don’t finish a project every month - that’s fine! We understand that sometimes life interferes with our best laid plans. 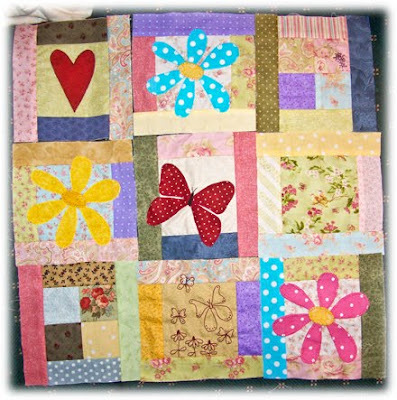 We also realise that some projects are meant to be long-term and have a LOT of work involved, like a quilt or a cross-stitch. The main aim of the OPAM Challenge is to give us all a little bit of a motivational boost and to give us all a big cheer squad to encourage and inspire us. However, as May Britt and I discovered last year, there is quite a bit of time and work involved in running the OPAM Challenge, so Peg and I have made a few more guidelines this time that we would ask people to please take note of AND please only sign up to join us if you intend to follow through. 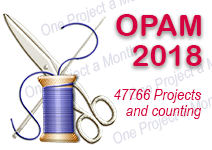 If for some reason during the year you decide you don’t wish to remain part of the OPAM Challenge, just drop Peg or me an email to let us know. Your name will stay on the list so that any finishes you DO register will go into the end of year draw, but we will make a note not to check your blog each month. Please read through all of the guidelines before you sign up. 4. Participants MUST provide all info asked for. Name, email and blog address. KRIS or PEG to join in the fun and above all, Peg and I do hope that you’ll have fun as you join us for OPAM 2010. And even if you don’t feel you want to commit yourself to being part of our challenge, I hope you’ll drop in to visit Challenge participants, whose blogs will be listed in the sidebar once we get rolling, to be encouraged and inspired in your own creative journey and to pass on encouraging comments to those whose work you admire. ... and this was to our left. Not bad, hey!! :0) Not at all hard to handle, I have to say and we all spent lots of time on the patio reading, snoozing, eating ... we also gathered everyone there for Christmas lunch. 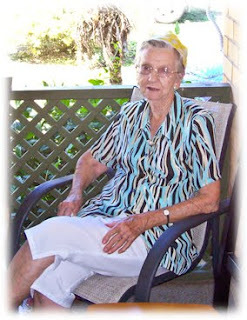 Here's Grandma with her party hat on, relaxing before lunch. 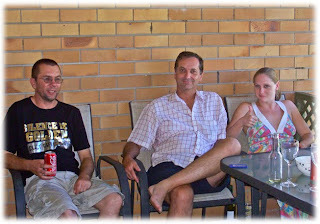 And here's my 'little' brother Paul, my Uncle Russell and my Cousin Samantha enjoying a few cool beverages on a steamy, hot Christmas day. 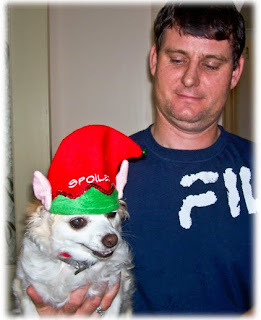 Even Mum's long-haired Chihuahua, Sunny, got into the Christmas spirit ... although he didn't really look all that impressed about his "Spoiled" Christmas elf hat! Tee! Hee! Hee! And it wouldn't be a traditional Aussie Christmas without the invasion of flies as soon as the first whiff of food wafts out of the kitchen! 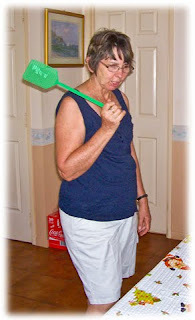 Here's Mum on flyswat duty - and it wasn't ONLY flies she swatted if you were slow walking past! Tee! Hee! Hee! 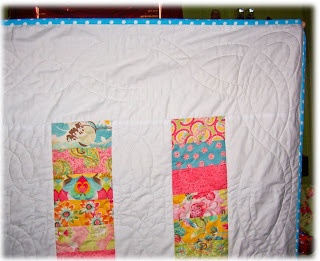 I love the Celtic knot design on the outside border (the same one as Mum's quilt) and Rosalie found a cool, slightly squarer Celtic knot pattern for the inside white borders and a groovy twisting vine for the 'coin' stacks. 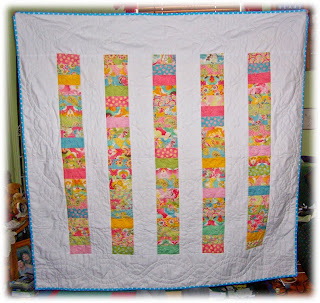 Thanks, Rosalie, for once again working your quilting magic for me!! :0) The wedding was last Saturday (in amongst our family catch ups), but the gifts weren't unwrapped before the happy couple headed off on their honeymoon (can't think WHY they wouldn't be thinking about anything except heading off on their honeymoon!! Tee! Hee! Hee! 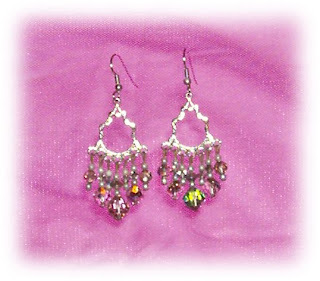 ), so still don't know how they like it - hope they do! One Project A Month Challenge for 2010! Don't forget to pop back here or to Peg's blog on Friday to read the Challenge guidelines and decide whether you want to join the fun or not. Remember, numbers are limited this year, so you'll have to be quick! :0) And a big "CHEERIO!" to Peg's Mum, too who's had to have a little stay in hospital. Sending lots of BEAR HUGS and wishes for a quick recovery!! Merry Christmas, Happy New Year - Behind already!! And as well as being behind in wishing you all a Merry Christmas and Happy New Year, I'm behind in letting you know the three extra prize winners I was responsible for announcing for the end of the 2009 One Project A Month Challenge. May Britt has already announced the December winner and her three extra winners taken from the full year's tally ... but you'll just have to wait a little longer before you find out who gets MY three prizes while I have a little say about the OPAM Challenge 09. CONGRATULATIONS, gals!! If you can all email me your snail mail addresses, I'll get your surprise prizes into the mail this week. to May Britt for her help and friendship as we ran with a much BIGGER 'little' challenge than either of us originally counted on! 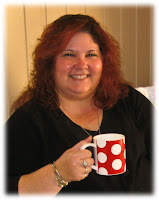 :0) May Britt and I were blogging buddies before teaming up to host OPAM, but our friendship has certainly grown and bloomed as we've worked together and gotten to know each other over the last 12 months. And I know that will continue this year, as May Britt says she will be the first person to sign up for this year's OPAM Challenge because she STILL has lots of kits and projects she wants to finish! Tee! Hee! Hee! I just KNOW we're going to have a ball encouraging you all and helping you keep track of all your stitching projects this year!! Make sure you pop over and welcome Peg to OPAM!!! 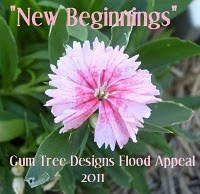 Peg and I will BOTH post the list of Challenge guidelines and sign up will be by EMAIL ONLY to help us keep track. Make sure you read ALL the guidelines and follow the instructions outlined when you sign up, cos numbers for participation will be limited and if you don't do it right, you'll miss out on all the fun! !